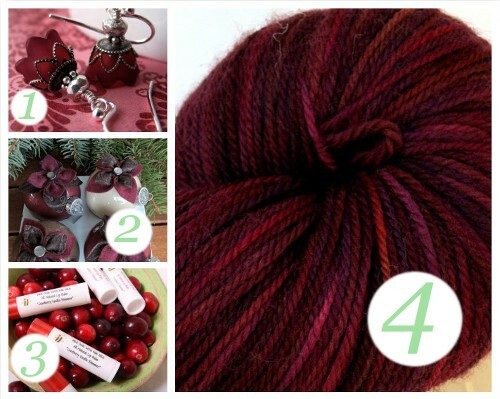 You know, one of the things I love best about Christmas is the rich, beautiful colors. (It’s that and the food, but back to colors.) This year I’ve been seeing a lot of cranberries stick around after November for Christmas time, and I think I like it! 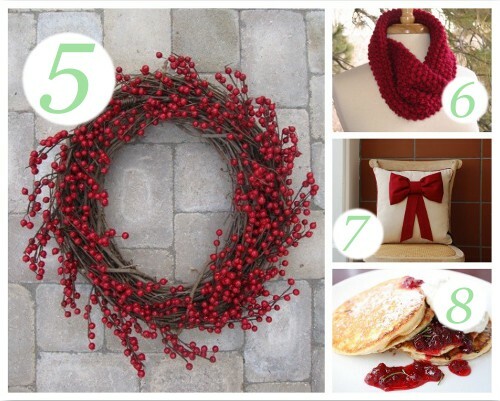 I really, really love the cranberry wreath. I saw one the other day where the main structure of the wreath was pinecones and then the cranberries were wrapped all around them. Love it! Maybe next year, though, this year we count ourselves fortunate to have our Christmas tree up. What about you? Have you seen cranberries peeking out of the Christmas decor this year? This entry was posted in Etsy Diving, I Want it Bad. I’m drooling over that cranberry jelly stuff! The only place I’ve seen cranberries this year is at the floral arrangements at work, and they’re spray painted silver. Um, yeah. We’ve got a tree with shatterproof balls, and that’s about it. I’ve been working on presents instead, and Snort keeps cuddling my yarn. That wreath is beautiful, though! I would love one like that.